Optimize your PC, make it cleaner and faster with Ensembles for Windows 10. Keep what you do on your computer private with this security suite. 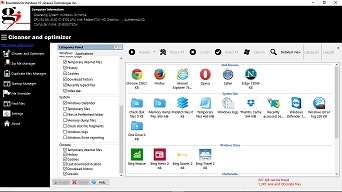 Ensembles for Windows is a set of 15 power tools that help you remove junk and obsolete files safely and easily. With an intuitive interface, Ensembles for Windows arranges junk files that are clogging up your system in an easy to understand manner. You may choose to view summary information which is arranged according to the host application or choose the more detailed view to view files. Ensembles for Windows allows you to select individual files to delete or you may choose to delete groups of files at once.